The movie was based on Robert Sherwood's popular and critical Broadway success. Both cinema posters above heavily emphasize its genesis in the Sherwood play. Sherwood's play became a staple of the American stage for years; the movie failed but Massey's stage and cinematic portrayal of Lincoln unfortunately helped stereotype Lincoln as a speechifying and rather staid man, rather remote from ordinary people. 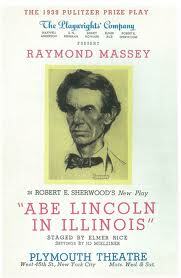 Abe LIncoln in Illinois was released less than a year after the success of director John Ford's Young Mr. Lincoln. 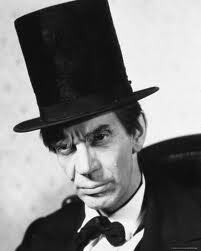 Although John Cromwell's cinematic version of the Lincoln story was based on Robert Sherwood's Broadway hit and Pulitzer Prize winning play, and featured Raymond Massey's repeating his highly-praised theatrical portrayal of Lincoln, the movie was a financial disaster for RKO studios. Viewed today, it comes across as static, verbose and gloomy. Compared with Ford's take on Lincoln, Cromwell's movie is inferior in almost every respect except cinematography. Yet Abe LIncoln in Illinois was an important and influential movie. Why? 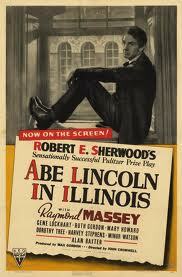 The Canadian actor Raymond Massey's portrayal of Lincoln was highly praised when Robert Sherwood's play Abe Lincoln in Illinois was a Broadway hit during the late 1930s. It has been performed many times since. 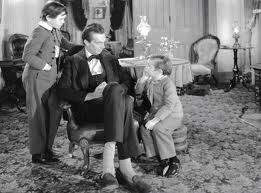 His performance in the film version was also well received by critics, gaining him an Academy Award nomination. 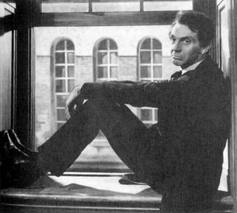 Massey reprised his stage performance when he toured the play and frequently repeated his role in later TV and movie productions. And 16mm prints of the movie were for years frequently shown in classrooms across America. Consequently, although Abe Lincoln in Illinois flopped at the movie box-office, Massey's depiction of the President was eventually seen by millions and became embedded in the public mind. In many respects Massey was ideally suited to play the role of Lincoln. Physically, he resembled Lincoln. Massey was tall (6'3"), thin, long in the face, saturnine. He had a commanding presence. His impressive oratorical skills came from stage experience ranging from Shakespeare to Greek tragedy. Unfortunately, both Sherwood's play (on which the screenplay is based) and Massey's performance depict Lincoln as inherently solemn, meditative, unbending and dignified. This Lincoln is lacking a sense of humor and more importantly, a sense of humanity. This is what we would call a politically correct portrayal of Lincoln - just a bit self-righteous, sober and lacking the common touch. He's a bit of a bore - well-intentioned, a man of rectitude, but almost too good to be true. This is not a Lincoln who can laugh at himself or interact effectively with others, as in Henry Fonda's more convincing and enjoyable depiction. It's significant that the Lincoln of Illinois is most convincing, and the film is most interesting, in the scenes with Mary Todd, played by Ruth Gordon as embittered and demanding. On this basic human level it becomes easy to empathize with Lincoln and to feel a sense of astonishment that he had deal with a dysfunctional family life as well as preserve the Union and wage a civil war. Abe Lincoln in Illinois gives some prominence to the fraught relationship between Lincoln and his wife Mary Todd, above left. 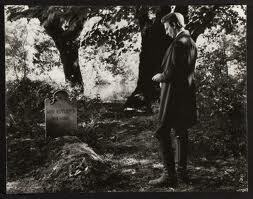 It also focuses on Lincoln's grief over the death of his presumed 'first love', Ann Rutledge. 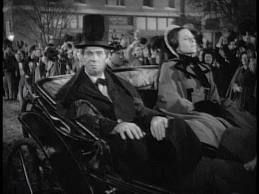 But above all, unfortunately, both the movie and Massey's portrayal depict Lincoln as a stern,depressed, rather forbidding person (above right). This impression of the President has prevailed in the public mind, and overshadows Lincoln's more complicated and humane personality, especially his homespun sense of humor and bluff common sense.